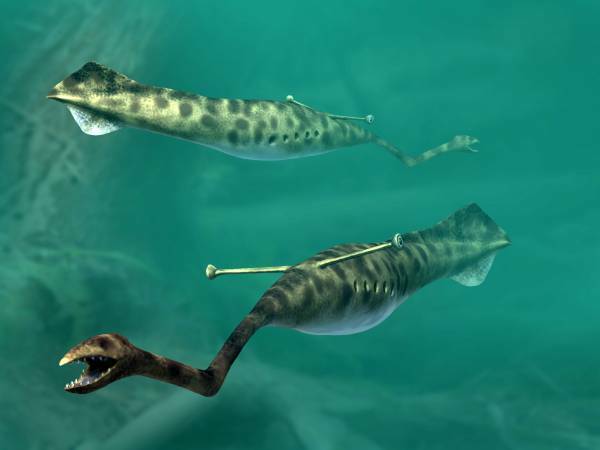 Tullimonstrum gregarium, known as the Tully Monster, is an extinct, soft-bodied vertebrate that lived in shallow tropical coastal waters of muddy estuaries during the Pennsylvanian geological period, about 300 million years ago. Examples of Tullimonstrum have been found only in the Mazon Creek fossil beds of Illinois, United States. Until 2016, its classification was uncertain, and interpretations of the fossil likened it to a mollusc, an arthropod, a conodont, or to one of the many phyla of worms. 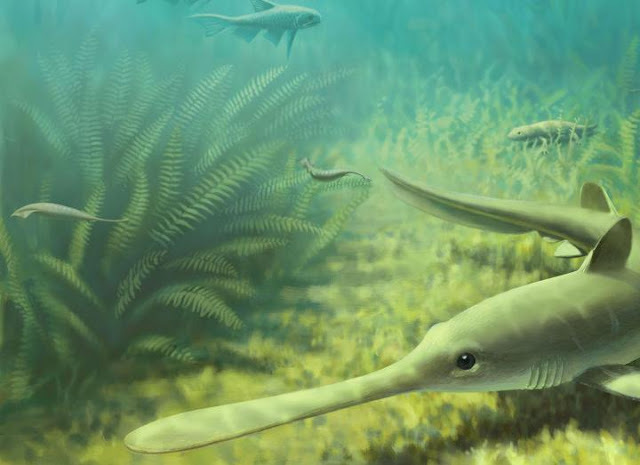 An illustration depicts what Mazon Creek may have looked like 300 million years ago, complete with Tully monsters (the two small swimming creatures), a large shark and a salamander relative. The fossil invertebrate collection at The Field Museum holds several fossil specimens of the Tully Monster (Tullimonstrum gregarium). These rare fossils were first discovered by an amateur collector and it still remains a mystery what type of animal it is. The Tully Monster from The Field Museum on Vimeo. "Having this kind of misassignment really affects our understanding of vertebrate evolution and vertebrate diversity at this given time," Sallan said. "It makes it harder to get at how things are changing in response to an ecosystem if you have this outlier. And though of course there are outliers in the fossil record -- there are plenty of weird things and that's great--if you're going to make extraordinary claims, you need extraordinary evidence."